Cathy Darby is a solution-oriented human resources professional who has held senior level HR positions in a variety of industries for over 25 years. She assists employers with a range of human resources support from legislative compliance (including wage and hour, equal employment opportunity laws and employee safety) to strategic staffing, training and performance management --foundational tools that stimulate positive attitudes, reduce turnover and increase productivity. 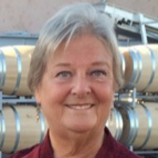 Firmly grounded in risk management principles unique to California, Cathy’s focus is on what employers can do to meet their business objectives, with the support of a strong and talented workforce. Cathy’s professional experience includes food manufacturing and multi-site retail, agricultural, funeral and community health care industries. She has experience in start-ups, turnarounds and plant closures in union and non-union, for profit and not-for-profit work environments. She brings pragmatism and creativity to problem solving and offers thoughtful and actionable advice to owners and managers alike. In this video learn about what Celiac Disease is. The BRC Global Standard for Food Safety was developed to specify the safety, quality and operational criteria required to be in place within a manufacturing organization of food to meet its obligations to legal compliance and customer protection. The format and content of the standard is designed to allow an assessment of local, systems and operational procedures of a company by a competent third party - the certification body - with the requirements of the standard. BRC ISSUE 7 Certification for food safety was published in January 2015, with a continuous focus on management commitment, risk analysis and a critical control point program for Safety of quality management based foods and system support. The aim was to direct the focus of the implementation of good manufacturing practices in the production areas with more emphasis on areas that have traditionally led to recalls and withdrawals. What is the BRC Global Standard for Food Safety? 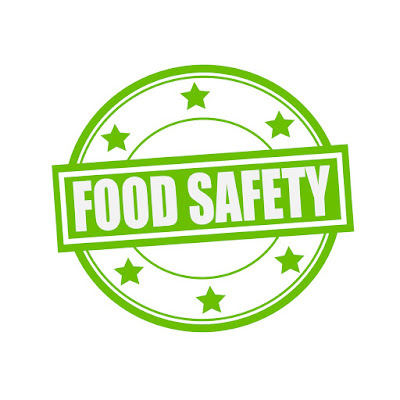 The global standard for food safety sets out requirements for the manufacture of processed foods and the preparation of primary products supplied as products to branded retailers, branded food and food or ingredients for use by food service companies, catering companies and food manufacturers. BRC ISSUE 7 Certification will relate only to products that have been manufactured or produced at the place where the check has taken place and will include storage facilities that are under the direct control of the production management of the site. The BRC Global Standard for Food Safety is a global tool based on the latest safety standards and made food day and methodologies. The requirements of the standard are related to the quality management system and HACCP (Hazard Analysis and Critical Control Point) system, supported by detailed prerequisite programs. Most UK retailers, and many European and global brand owners and food processors, only include suppliers certified to the BRC Global Standard for Food Safety in their supply chain. In the case of a food safety incident, ensure legal protection under the concept of due diligence. Have management of efficient supply chain by reducing second party audits and increase overall reliability of your supply chains. 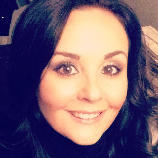 Margaret Baez, Business Manager offers recruitment solutions built on solid expertise. Starting her recruiting career with North America's leading nonprofit provider of education, training, and career services Margaret effectively designed specific training for workers in industries as diverse as banking, retail, hospitality, manufacturing, food industry and healthcare. She also offered employers strategies for retaining top talent. Margaret then transitioned into developing the Northern California Permanent Placement Division for the world's leading staffing provider. It is Margaret's proactive commitment to the right fit that resulted in her progressive relationships with companies who understand that the key to their success begins with the people. Likewise candidates who know Margaret know that they can count on her to deliver the next step in their career. Recruiting Associates Network is a key resource in local and national food and beverage industry recruitment. Our efforts are driven by the satisfaction of our candidates and clients alike. We are a one stop recruitment solution for a wide variety of organizations and the "in the know" recruitment associates for busy professionals. The simple key to our success is delivering top notch talent to our customers and providing outstanding opportunities to our candidates. 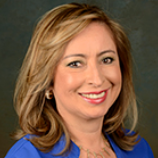 Martha Camacho co-founded Superior Food Safety with Oscar Camacho in 2009. Mrs. Camacho previously worked as the co-founder and Marketing and Sales Director of two food companies and worked as a General Manager of a packaging Company. Martha is an entrepreneurial sales and marketing professional with over 27 years of experience. Accomplishing sales and marketing goals with growing operations from zero to millions from her own companies, small businesses to big companies. At Superior Food Safety, she supports new product development, launches new projects, manages event planning, and food safety education through classes, workshops and various events. Martha has a degree in Tourism Administration and various extended courses in Marketing, Sales and Business Development in the Food Safety Industry. HACCP is a management system in which food safety is addressed through the analysis and control of biological, chemical, and physical hazards from raw material production, procurement and handling, to manufacturing, distribution and consumption of the finished product. For successful implementation of a HACCP plan, management must be strongly committed to the HACCP concept. A firm commitment to HACCP by top management provides company employees with a sense of the importance of producing safe food. HACCP is designed for use in all segments of the food industry from growing, harvesting, processing, manufacturing, distributing, and merchandising to preparing food for consumption. Prerequisite programs such as current Good Manufacturing Practices (cGMPs) are an essential foundation for the development and implementation of successful HACCP plans. Food safety systems based on the HACCP principles have been successfully applied in food processing plants, retail food stores, and food service operations. The seven principles of HACCP have been universally accepted by government agencies, trade associations and the food industry around the world. The following guidelines will facilitate the development and implementation of effective HACCP plans. While the specific application of HACCP to manufacturing facilities is emphasized here, these guidelines should be applied as appropriate to each segment of the food industry under consideration. The production of safe food products requires that the HACCP system be built upon a solid foundation of prerequisite programs. Each segment of the food industry must provide the conditions necessary to protect food while it is under their control. This has traditionally been accomplished through the application of cGMPs. These conditions and practices are now considered to be prerequisite to the development and implementation of effective HACCP plans. Prerequisite programs provide the basic environmental and operating conditions that are necessary for the production of safe, wholesome food. Many of the conditions and practices are specified in federal, state and local regulations and guidelines (e.g., cGMPs and Food Code). 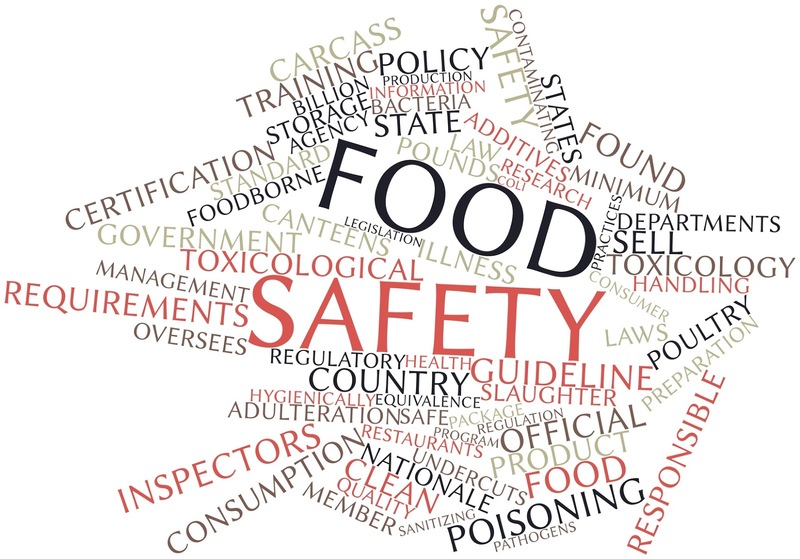 The Codex Alimentarius General Principles of Food Hygiene describe the basic conditions and practices expected for foods intended for international trade. In addition to the requirements specified in regulations, industry often adopts policies and procedures that are specific to their operations. Many of these are proprietary. While prerequisite programs may impact upon the safety of a food, they also are concerned with ensuring that foods are wholesome and suitable for consumption. HACCP plans are narrower in scope, being limited to ensuring food is safe to consume. The existence and effectiveness of prerequisite programs should be assessed during the design and implementation of each HACCP plan. All prerequisite programs should be documented and regularly audited. Prerequisite programs are established and managed separately from the HACCP plan. Certain aspects, however, of a prerequisite program may be incorporated into a HACCP plan. For example, many establishments have preventive maintenance procedures for processing equipment to avoid unexpected equipment failure and loss of production. During the development of a HACCP plan, the HACCP team may decide that the routine maintenance and calibration of an oven should be included in the plan as an activity of verification. This would further ensure that all the food in the oven is cooked to the minimum internal temperature that is necessary for food safety. The success of a HACCP system depends on educating and training management and employees in the importance of their role in producing safe foods. This should also include information the control of foodborne hazards related to all stages of the food chain. It is important to recognize that employees must first understand what HACCP is and then learn the skills necessary to make it function properly. Specific training activities should include working instructions and procedures that outline the tasks of employees monitoring each CCP. 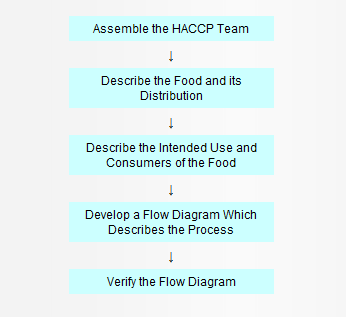 In the development of a HACCP plan, five preliminary tasks need to be accomplished before the application of the HACCP principles to a specific product and process. The five preliminary tasks are given in Figure 1. The Global Food Safety Initiative (GFSI) approves various food safety schemes which allow certified food companies to market their products and services anywhere worldwide. GFSI has brought order and harmony to food safety standards, reducing duplicate auditing in supply chains and providing worldwide proof of adherence to acceptable standards while leaving flexibility and choice to companies in the food industry. Some of the major food safety standards that have been successfully benchmarked by GFSI are British Retail Consortium (BRC), Safe Quality Food (SQF), International Food Standard (IFS), FSC 22000, PrimusGFS, GlobalGAP, and CanadaGAP. Each has its place in the food industry. Some are a better fit for crop farms while others apply to food processers, packagers and distributors. This flexibility has accelerated the fast adoption of GFSI-approved standards within food industries. These companies typically demand that suppliers in their food chain demonstrate achievement of an acceptable GFSI-approved standard or at least a verified HACCP Plan (which is the basis of most GFSI standards). The giant retailer Wal-Mart, for example, requires their suppliers to achieve a GFSI-approved certification or risk losing their business. The momentum to gain a GFSI-approved certification has increased with the 2011 passage of the Food Safety Modernization Act (FSMA) in the U.S. and similar measures approved worldwide. While the Food and Drug Administration (FDA) is slowly implementing FSMA rules for domestic companies, it is cognizant of GFSI-approved schemes and seems to be charting a parallel path, one that will make it easy for those in the food industry to comply with FDA regulations if they already hold a GFSI-approved certification. Independent consultants are available to assist food growers, manufacturers, processors, packagers, food service operators, distributors, transporters and retailers prepare for certification under a GFSI-approved standard of their choice. 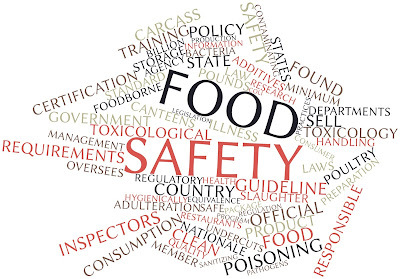 Working with a knowledgeable consultant is the quick path to achieving recognized food safety certification, an investment that pays for itself many fold over time. The hand writing is on the wall. Companies in the food industry today that do not have an acceptable food safety certification are on the road to extinction. World governments are cracking down on outfits that provide tainted goods, misbranded products or cannot demonstrate fast, effective recall systems. Ccertification is fast becoming a prerequisite for participation in profitable supply chains and thus business survival. The safest and most lucrative route for those in the food industry is to focus on achieving certification under a standard successfully benchmarked by the Global Food Safety Initiative.